Dynamite Headdy was a brilliant and fun little platformer for the Sega Megadrive (Genesis in the States) made by perennail game design gods Treasure. Treasure had a great habit of coming up with compelling, fun and genre twisting games for Sega’s Machine. Dynamite Headdy was one of those games. In this game you play Headdy, a puppet in the theatre who is trying to win the affections of a girl. However, before he can do anything about it, she along with a number of Headdy’s friends are captured and imprisoned. You have to rescue them. Headdy’s name kind of suggests what his weapon is. 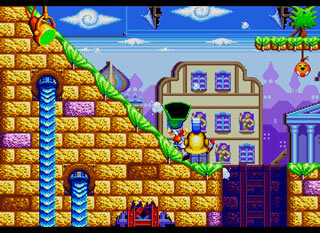 You see, Headdy has a detachable head, and to defeat enemies and progress through levels, you have to master a number of interchangable heads. The heads are obtained from boxes. Some make you more powerful (such as the hammer head and the vaccuum head – which possibly can be voted as one of the coolest powerups ever made in the history of gaming), others are essential to master and get through the game – such as the spikey head and the tiny head. Others are completely useless like the bloated head which makes you slow and basically a sitting duck. This game was a lovely twist on platformers of the time, which usually fell into the Sonic/Mario mould, a almost unique weapon (okay, Decapattack did something similar, but not to the level as this game) in a madcap game. There were also some completely original levels never seen before. One level the platform you were on would turn from sideways on to an up and down platform, giving you an extra dimension to travel in. It’s horrendously difficult to explain but it was so cleverly done I urge you to play this game to understand it. It also has an excellent, Treasure-esque look to it. Like Gunstar Heroes before it, is moves at a fair whack too, and has a fairly memorable soundtrack. 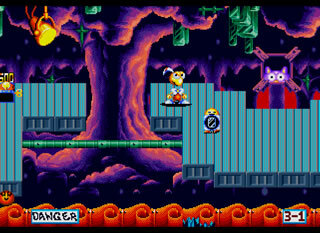 If you love platformers like this, you can’t do too much worse than this fine offering.